New Events open to the general public are found by clicking the Calendar link on this page. Events and photos are also posted on our Face Book page. UCCE Master Gardeners can access the Volunteer Management System (VMS) to view volunteer opportunities, post volunteer hours and sign up for events. (Desert) Indio: Email your question to: anrmgindio@ucanr.edu or call (760) 342-2511 to leave a message. Ask us about how to save water in your landscape, what's damaging your plants, how to make and use compost in your own backyard, what's ailing your trees, or any gardening-related question, we're here to help! Call us, email us, or leave a message anytime. Learn to be water-wise in your yard and garden! Fall is a good time to introduce new plants in your yard allowing them to become established by winter rain. Even California native plants aren't drought-resistant until they become well established. 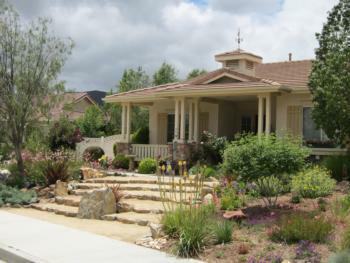 Take advantage of these water-wise tips for plant and lawn care. Take a Class! Join an Event!